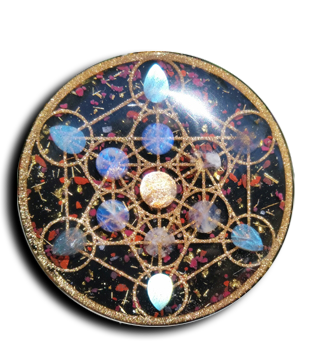 This is very precise Flower of Life made out of Resin, Crystals and Metal ( aka orgone). It is 24″ in diameter and 1″ thick. The Flower of Life design is cast with Steel shavings, Labradorite, and Galena. There are 42 Quartz crystals placed in 7 groups of 6 highlighting one of the many sacred geometrical pattern in this design.